With origins that go back to the bass figures of the early bluesmen the power chord has become an essential part of any rock guitarists arsenal. 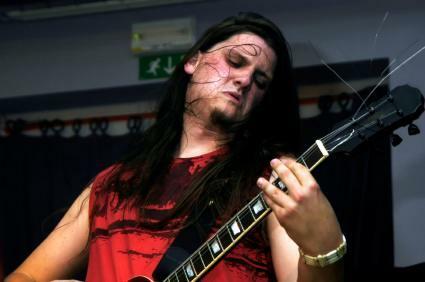 Through the chord patterns of 60's surf rockers and the riffs of pioneering heavy metal group Black Sabbath to 90's grunge and punk acts Nirvana and Green Day, power chords have become part of guitarist's repertoire. The great news for beginner or intermediate players just getting into power chords is one easy to play shape is all that's needed to play every possible power chord. To form a power chord, fret any given note with your first finger on either the sixth or fifth string, and then fret the note on the adjacent string two frets higher with your third finger as in examples 2 and 3 on the Guitar Power Chords Chart. The note on the lower string is the root, or name of the chord. Only play the two notes you are fretting, omitting all other strings. This two-note chord, consisting of the root and its perfect fifth, makes a power chord. The following exercises will help you master these chords. The four examples in this printable will serve as the basis for this lesson. To print, click on the image. If you need help, consult this Guide To Adobe Printables. Using example one of the Guitar Power Chords Chart, learn every root note on the sixth and fifth string. This will help you learn the fret board so you can play any of the twelve possible power chords with ease. Create some patterns to play with power chords. For example | A | D | G | C || and | F | Ab | Bb | C | and more. Visualize the patterns and experiment with different combinations. Learn and play the patterns to simple songs using power chords. You Really Got Me by the Kinks, Paranoid by Black Sabbath, and Smells Like Teen Spirit by Nirvana are some great easy examples to start with. Learn and play the riffs to popular rock tunes with power chords. Deep Purple's Smoke On The Water, Cream's Sunshine Of Your Love, and Seven Nation Army by the White Stripes are some classic riffs that sound great with power chords. One of the best ways to improve your technique is to learn and play scales. 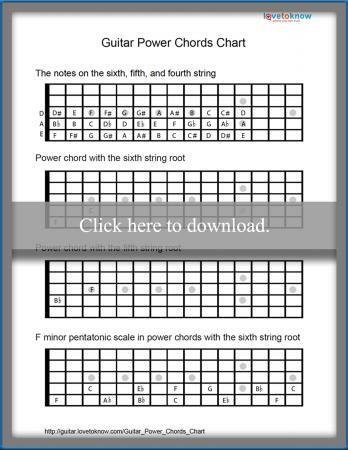 Example four on the Guitar Power Chords Chart is the F minor pentatonic scale with power chords. Play this scale up and down the neck evenly. Play any and all other scales you know with power chords. Play them in all twelve keys. Using a metronome to achieve great timing, play these power chords exercises at slow, medium, and fast tempos. Experiment with different rhythms and picking patterns with these power chord combinations. Try quarter notes, eighth notes, triplets, and more, and use all downstrokes, all upstrokes, and alternate picking. Power chords will open you up to new styles and sounds. Once you gain some basic technique, have fun with them. The music you'll learn is visceral and the kind to just let loose and wail a little with. An added benefit of learning and using power chords is the technique and control you'll achieve with your picking hand. Get started and get powerful!